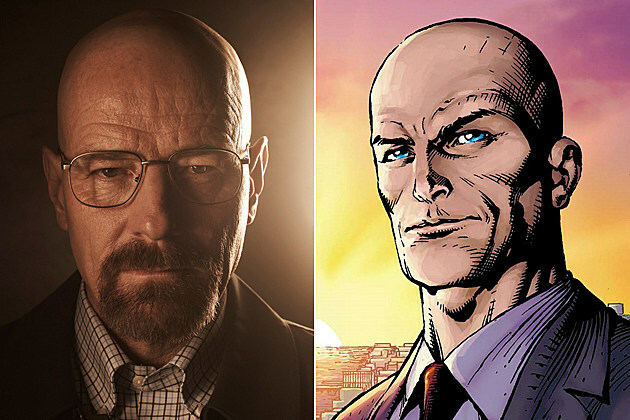 "Breaking Bad"s Bryan Cranston Cast as Lex Luthor in Man of Steel Sequel? According to a report by Cosmic Book News, Bryan Cranston, most notably famous for the lead role in the hit AMC show Breaking Bad, has supposedly been cast as Lex Luthor in the upcoming Man of Steel sequel. Cranston has reportedly signed a deal that includes at least six appearances within the DC film universe, meaning that Luthor may be playing the equivilant of Samuel L Jackson's Nick Fury, with it all wrapping up into Justice League. Cranston will be co-starring Henry Cavill as Superman, and Ben Affleck as Bruce Wayne/Batman, although it is unknown if Wayne will actually be wearing the cape for this film. With this news being mentioned directly after Ben Affleck's casting as Batman, it is hard to tell the difference between rumor and fact, especially since rumors have also begun to circle around Matt Damon as either Aquaman or Martian Manhunter, so far know, DC fans will just have to wait and see what Warner Brothers has up it's sleeves. Clearly, DC has gotten Justice League on people's minds, which is exactly what they're going to have to do if they have any hope of reaching the power that Marvel's Avengers did when it hit theaters. Man of Steel 2 is directed by Zack Snyder and hits theaters Summer of 2015. Turns out this was nothing more than a rumor, and Cranston has confirmed in an interview with Boston.com that he has nothing to do with the upcoming Man of Steel sequel.